When you are facing a legal issue, you need an advocate and advisor with the knowledge and experience to handle your matter effectively and efficiently. You need an attorney that will take the time to develop a relationship with you to understand not only your desired outcome, but to help identify factors you may not even realize are important to your case. Treasure Coast Legal’s goal is to provide representation that fosters a relationship lasting years after your case or transaction is resolved. Hiring an attorney is one of the most important decisions you make in your lifetime, and the attorneys and staff at Treasure Coast Legal know that when you are injured, facing criminal charges, going through a divorce, buying a home or dealing with any legal issue, you need the peace of mind that you are represented by counsel you can trust. Shaun Plymale, a lifelong resident of Martin County, founded the firm in 2008 with the vision and intent to serve the community as both an advocate for the firm's clients and as a volunteer and patron of numerous local charitable organizations. He specializes in the areas of Personal Injury, Criminal Defense and Divorce and Family Law. He received a degree in Financial Management from Clemson University and his law degree from the University of Florida. After graduating, he worked as an Assistant State Attorney in Tallahassee. Handling hundreds of DUI cases as a prosecutor, serving on the Statewide DUI Technical Advisory Board and teaching DUI case preparation at the Florida Highway Patrol Academy, Leon County Sheriff's Office and the Tallahassee Police Department provided Plymale with the experience to come back home and enter private practice. Plymale returned to his home town of Stuart in 2002 and was hired by Crary Buchanan, where he was named a Partner in 2006. Working for one of the oldest and most respected firms in Martin County allowed Plymale to expand his practice into the areas of Civil Litigation and Personal Injury. In 2008, Shaun co-founded Chapman & Plymale Law, P.A. and has since handled thousands of injury related claims from auto accidents to wrongful death in addition to representing clients in many areas of the law. Plymale is joined by attorneys Louis N. Larsen, Daniel Haggerty, Robert G. Rydzewski and Katherine Donaldson who bring years of Litigation, Real Estate Law, Bankruptcy Law, Estate Planning, Criminal Defense, HOA Law, Family Law and Personal Injury experience to the team. Shaun has assembled a staff of paralegals and support staff with decades of experience and deep ties to the Treasure Coast. Treasure Coast Legal proudly serves the cities and communities of St. Lucie, Martin, Palm Beach, Indian River and Okeechobee counties. They are available for consultation at their offices conveniently located in Stuart, Fort Pierce and Port St. Lucie. 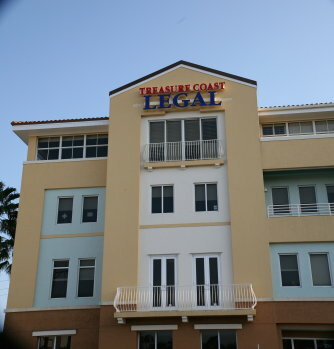 Treasure Coast Legal strives to handle all of their client’s legal needs and they maintain relationships with other reputable attorneys when clients require services that the firm does not provide.